Thai eateries are ubiquitous in New York City, but that doesn't mean that one is as good as the next. For you pad Thai, green curry, and pineapple fried rice fanatics (count us in that club!) — or for those of you craving more adventurous and spicier takes on authentic regional dishes — we want to ensure that every bold and flavorful bite counts. Look no further than this list of the eight top-rated Thai restaurants in all of NYC. Note that while many of these eateries are located in Manhattan, there are several destination-worthy restaurants that come set within the multicultural crossroads of Queens, too. For more than 20 years, this temple to Thai cuisine has marked a culinary pilgrimage point for Thai-craving palates from across the city, beckoning gourmands to a little-visited corner of Woodside, Queens. Originally opened to cater to the local Thai community, this real-deal restaurant has expanded considerably over the years, including the addition of a spacious backyard patio garden with tables. But nothing is as expansive at SriPraPhai (the restaurant shares its hard-to-pronounce name with its Thai owner) as the multi-paged menu with its mind-boggling assortment of appetizing choices for authentic Thai fare. Try any of the noodle or curry dishes as a main, and you can't go wrong with the watercress or papaya salad or ground catfish for a starter. There are numerous vegetarian options on hand, too, and a full bar to help offset those spicier plates. Note that the restaurant is closed on Wednesdays and is cash only. This unpretentious Nolita Thai restaurant earns accolades for its creative and contemporary take on Thai, an inventive bar menu (beer slushies, anyone? ), and vintage Bangkok flea market-inspired decor. Owned by Thai native Ann Redding and her husband Matt Danzer (both are Per Se alums), the focus here is on complex flavors and high-quality ingredients. 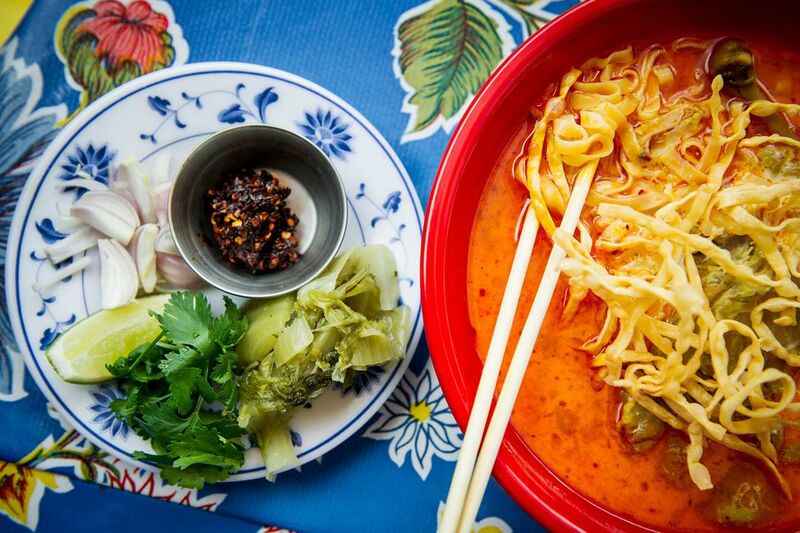 Don't miss the northern Thai-style Khao Soi, with its coconut milk and curry base, homemade egg noodles, and chicken leg, all flavored with fresh turmeric. For small plates, try the Mee Krob, a traditional crispy noodle salad with egg, shrimp, peanuts, and tamarind sauce, all finished off with sweetbreads, or the Mieng Kum is yet another hit, wherein a mixture of dried shrimp, coconut, ginger, peanuts, and chilis comes wrapped in betel leaves. Another Queens mecca for standout Thai, the vibrant and friendly little eatery Ayada Thai, in the off-the-beaten-path Elmhurst neighborhood, is well worth seeking out for its lengthy menu of mouthwatering and authentic Thai eats, representing all regions of Thailand. Come for your fill of spicy and complex curries (prepare to break a sweat), like the duck Penang curry or the tamarin-infused sour curry loaded with shrimp and a broccoli omelet. With a sleek minimalist design and concentration on regional Isan cuisine (from northeastern Thailand), Somtum Der — a branch of a well-known Bangkok-based eatery — is a Thai go-to in the East Village. Shareable plates included popular dishes like their signature spicy papaya salads (if you're feeling adventurous, try the version with fermented fish sauce and freshwater crab), grilled meats (like pork skewers marinated in coconut milk), and hot soups (don't miss the grilled catfish option). This bustling East Village eatery near Union Square is known for elevated Thai cuisine with a modern twist. Check out dishes as they're prepared in the open kitchen by Chef Hong Thaimee, with ingredients largely sourced from local area farms and an emphasis on hormone-free meats and sustainable seafood. Curries, hand-pounded papaya salads, and rich sauces abound, as do inventive cocktails (try the Thai Iced Tea-Tini, made with Thai tea, condensed milk, and vodka). Don't miss the pad Thai — some say it’s the very best in the city. Homemade noodles, sourced from an old family recipe, are the name of the game at this Hell's Kitchen hot spot. With a small dining room and simple menu, what the restaurant lacks in size and scope it more than makes up for in flavor. Try crowd-pleasers like the Ratchaburi handmade egg noodles with crab meat and roasted pork, or the Nakorn-Patom soup featuring thin rice noodles, duck meat, and a ﬁve-spice soy broth. Plenty of tasty stir-fry dishes are on hand, too. Another of the Queens powerhouses on the Thai culinary scene, the small, no-frills Chao Thai in Elmhurst is a destination in and of itself, thanks to the spicy kitchen skills of chef-owner Ratchanee Sumpatboon. Prepare your palate for a fiery onslaught of Thai dishes (take heed of the items noted on the menu with a spicy asterisk!) with a refreshing papaya salad, then dive in on specialties like the spicy-meets-sweet Chili Paste Fried Rice or the Pad Duck, served in basil sauce.